In 1809, Regency high society was momentarily captivated by a scandal involving Prince Frederick, Duke of York. Six years previously, the duke had taken up with Mary Anne Clarke, who became the most famous of his many mistresses. The duke was commander in-chief of the army, and rumours abounded that Clarke was subsidising her lavish lifestyle by selling access to the duke, and even commissions. The rumours grew to such an extent that there was a 10-day parliamentary inquiry into the duke’s conduct. His public image took a lashing, and an unsympathetic caricature by Isaac Cruikshank, which showed a giant Clarke wearing the duke’s military cloak over a crowd of miniature soldiers, clergymen and others, circulated widely. Although he was cleared of wrongdoing, the duke resigned his position as commander-in-chief (he was later reinstated). Clarke, on the other hand, freely admitted to providing access to the duke, and reports of her spirited testimony turned her into something of a public heroine. Popular support for Clarke was fanned by the existence of flattering portraits of her, which were also widely disseminated as engravings and prints. Though Clarke’s popularity was to decline sharply – in 1813 she was imprisoned for libel in another matter – the part played by portraits in championing her cause is remarkable. The contemporary miniature paintings of Mary Anne Clarke indicate how much the form had evolved over the previous three centuries. Portrait miniatures were traditionally commissioned by royalty to celebrate births, marriages and deaths. Originating in the 1520s as small, private images (though occasionally bestowed in public ceremonies), they were typically painted in watercolours on vellum. The most celebrated artists were court painters such as Nicholas Hilliard (1547–1619) and Richard Gibson (1615–90), who were the personal miniaturists of Elizabeth I and Charles II, respectively. In the early 18th century, British portrait miniaturists began to paint smaller portraits on ivory, rather than vellum, and the latter half of the century saw the beginning of specialised training in the genre: a number of prominent and skilled miniaturists who emerged in the late 1760s took lessons at William Shipley’s drawing school, the first of its kind in London, which opened in 1754. By the time of the scandal of the Duke of York and Mary Anne Clarke, both the size of the portraits and the nature of the patrons who commissioned them had changed. These slightly larger portraits, now frequently painted on paper, were often intended for more public display in the home, rather than to be worn on the body; they could even, as in the case of Mary Anne Clarke, be widely circulated as part of a public relations campaign. In 1795, Buck made his way from Ireland to London and made the professional acquaintance of the printmaker William Holland, who published engravings of many of Buck’s miniatures. Buck also produced a number of libertine, slightly impolite images of Regency life, many of which were published and sold by Holland. But in 1809, the painter seems to have quarrelled with the printmaker over subject matter, and from this period on is a painter of only the most respectable imagery. In part, perhaps, the transition was precipitated by Buck’s other main commercial relationship in London, that with Rudolph Ackermann. Proprietor of the Repository of Arts, a fashionable shop on The Strand in London and magazine of the same name. 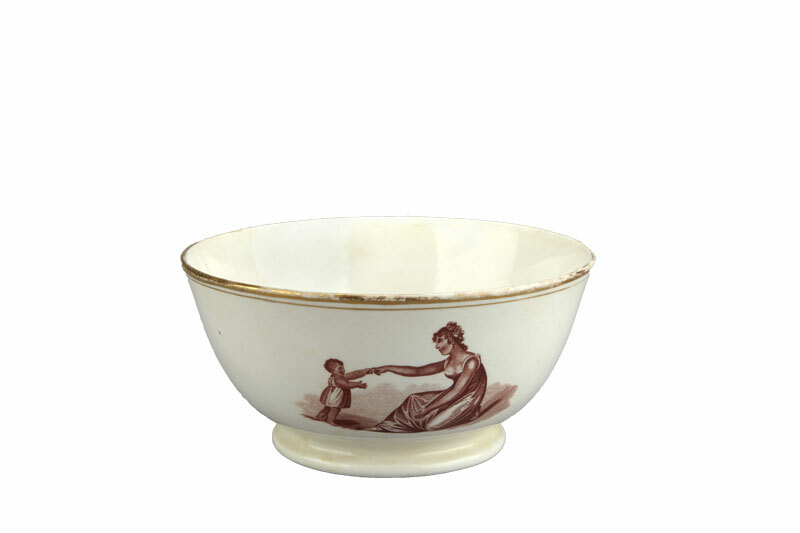 Ackermann sold many prints after Buck’s watercolours and also ceramic tableware decorated with the same prints. More conservative than Holland, Ackermann would likely not have tolerated the salacious images being produced by Buck, and Buck seems to have made a calculated decision to adjust to changing social mores. One of Holland’s clients was the Duke of York, which explains, in part, Buck’s connection with Mary Anne Clarke. Buck seems to have been quick to note the importance of Clarke to the duke. He painted her for the first time in 1803, the same year in which she met Prince Frederick. 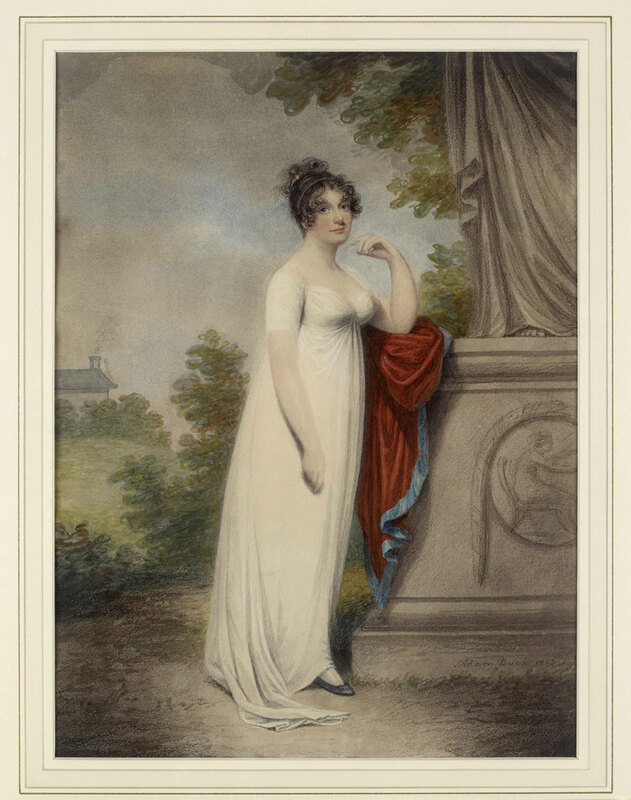 He painted her again in 1809 during the parliamentary inquiry – an oversized miniature that was translated into an engraving and widely published, and which did much to help Clarke’s transformation from a shady mistress into a public heroine. Impressively, Buck seems to have remained on good terms with the duke following the scandal, as he exhibited a portrait of him in 1812 to partner an earlier portrait of 1804. Though much of Buck’s later career was spent as a painter to the gentry so well-described in the novels of Jane Austen – landowners, clergy, officers, and sailors – the events surrounding the Duke of York are a reminder that Buck was at one time closely linked to the uppermost echelons of Regency society. Few examples of Buck’s work from before his move to London survive. 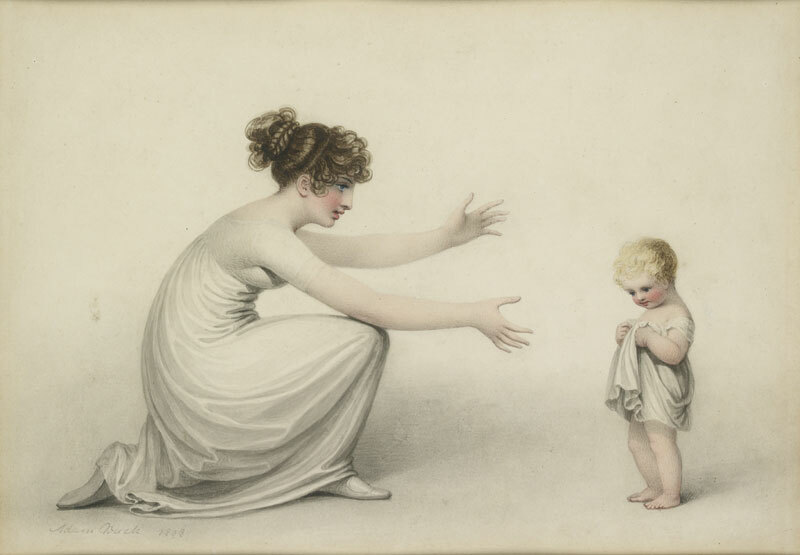 His younger brother Frederick Buck (1765–1840) was also an established miniature painter, whose rougher, harder style influenced Buck’s earlier works. These Irish paintings display a similar hardness, completely uncharacteristic of the work he produced after leaving Ireland. Though Frederick has often been considered the most significant early influence on his brother’s painting, Sampson Towgood Roch (1759–1847), a Cork-based contemporary, is also recognised as another influence on Buck’s early technique. However, Buck’s most important source of inspiration was undoubtedly the antique. Eighteenth-century Dublin, where Buck worked for a time, was a centre of the classical revival. This was prompted in part by the rediscovery of Herculaneum and, more significantly, Pompeii, in 1709 and 1748 respectively. Numerous engravings of finds from the sites were made and distributed, including a lavish eight-volume edition of Le Antichità di Ercolano, published between 1757 and 1792. The sculptor John Flaxman’s famous 1793 illustrations of Homer’s Iliad were engraved and published in 1795 to great acclaim. Though such volumes had relatively small circulations, they revolutionised taste and had a significant impact on the work of artists and designers across Europe, who repeated motifs from the publications in works of both fine and decorative art. Already, in Buck’s earliest known works from the late 1770s to the early 1780s, there is a clear sense of the artist’s keen interest in the neoclassical. His women are dressed in flowing Greek-goddess gowns and his grouped figures are flattened as if depicted on Greek vase paintings. 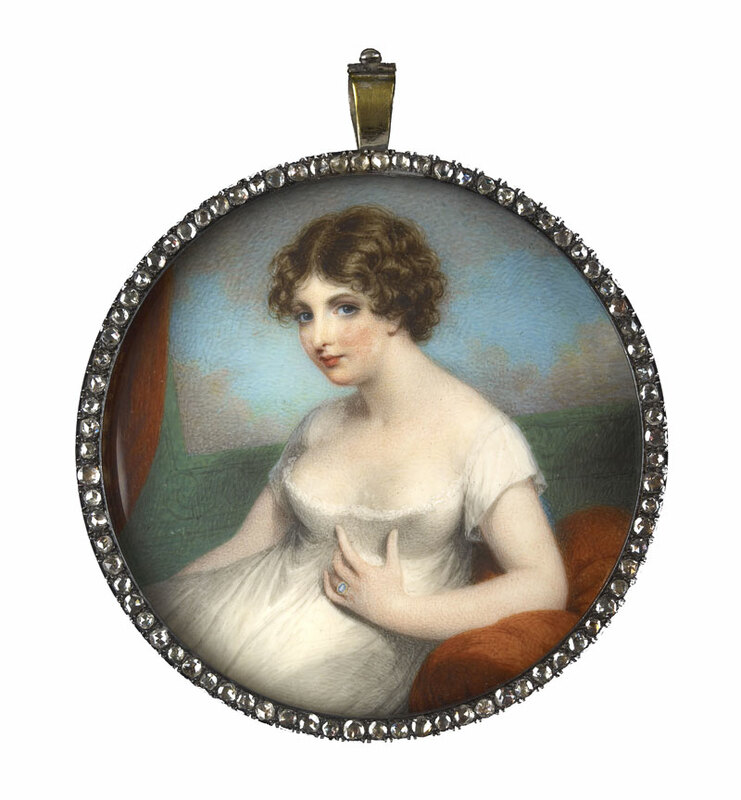 Many of Buck’s miniatures, such as a portrait of the writer Maria Edgeworth from around 1790 – she was the daughter of Richard Edgeworth, a one-time patron of Buck’s – are painted in side profile, as if on a Roman coin, rather than in the more traditional miniature poses of three-quarter turn or face-front position. While Buck may not have possessed the anatomical accuracy and painterly finesse of near contemporaries such as John Smart (1740–1811) and Richard Cosway (1742–1821), or Andrew Robertson’s (1777–1845) desire and technique to emulate grand oil portraits, Buck’s brand of idealised classicism made him a favourite choice for the women of the day. After making his name as a portrait miniaturist in Ireland, and then again in London as a painter of the Duke of York and his circle, from 1807 onwards Buck created a new niche for himself with his oversized miniatures on paper. Drawing heavily on Buck’s love of antiquity, the vast majority of these new-style miniatures show not so much a new direction for the artist, but rather a perfection of the sentimental and highly idealised images of women and children that he had been painting since his early days in Ireland. In The Darling Awake (1809) and First Steps (1808), for example, the heads again appear in side profile, echoing numismatic portraits from antiquity. No receding landscape serves to distract the viewer; the focus instead is on the pleasing shapes made by curved arms and backs and draped Grecian gowns. 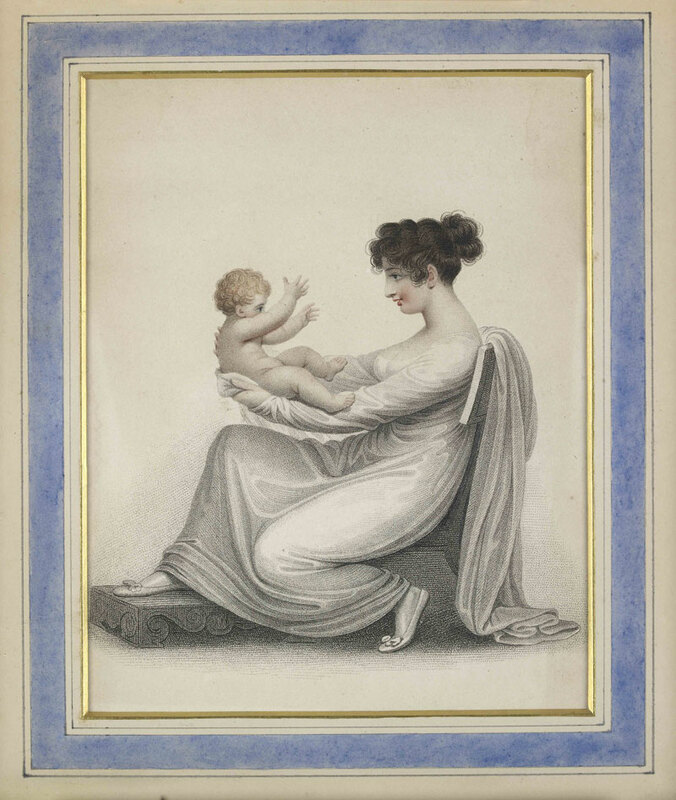 Such stylised poses become a key way in which Buck expresses his neoclassical inclinations – the mother’s pose in The Darling Awake is repeated almost exactly in The Artist and His family (1813), which presents Buck and his wife and two children surrounded by Greek vases, friezes and herms. The Regency, however marks the beginning of the decline for both the passing fashion for neoclassicism and the much older tradition of portrait miniatures. It was no longer possible for an artist to make a career as a miniature portrait painter. Sir William Charles Ross (1794–1860), Queen Victoria’s miniaturist, was the last great miniature painter, producing painstakingly detailed and fashionably large portraits that few could afford. Though the daguerreotype arrived too late for Buck, who died in 1833, or for any of his near-contemporaries to notice a significant impact on their market, the advent of photography certainly meant that the great age of the miniature portrait was over. The spread of commercial photography in the early 1840s made a new kind of portraiture more affordable to a wider public. Similar shifts in taste, technique, technology and patronage are more obvious across the history of full-sized oil portraits, but they are nevertheless equally visible across the history of portrait miniatures – if you care to look. The subtlety and sophistication of such changes have often been overlooked, since the miniature is often regarded more as a design object than as a work of fine art. One of the aims of the exhibition dedicated to Adam Buck at the Ashmolean is to try to reveal the nature of such shifts. ‘The way his career developed, not just in what he painted, but also in his subjects and techniques, reflects changing fashions,’ Whitely says. ‘In his early years, he painted in wax and pastel, but he dropped pastel when it fell out of fashion – after 1800 it was hardly used at all.’ Buck followed this trend by trading pastels for watercolours and transferring, too, from the technically difficult, but traditional, ivory used by most miniature painters to paper. In this shift from pastel to watercolour, and from ivory to paper, Buck was part of a long tradition of miniaturists, but expanded the traditional role of the portrait miniature from a private, memorial object to portrait art worthy of public display on the wall. From the early 1820s, Buck produced these larger miniature watercolour portraits on paper in great numbers, turning them out on a factory principle. ‘Because of the way he worked, Buck is variable in quality,’ says Whiteley. ‘At his best, he’s magnificent. At his worst, he’s trite. He was quite a slack painter, in many respects. The landscape is quite perfunctory, the architecture is out of perspective. The heads, though, are always splendid.’ And yet, perhaps it is precisely this slackness, this lack of interest in landscapes and backgrounds to focus on the features of the subject that contributed not only to Buck’s popularity as a portrait miniature painter, but also to the use by manufacturers of his small portraits on a bewildering array of ceramics and other domestic objects, from soup bowls to ladies’ fans. Nevertheless, Buck failed to keep up with the fashions for much longer and died in poverty in 1833. 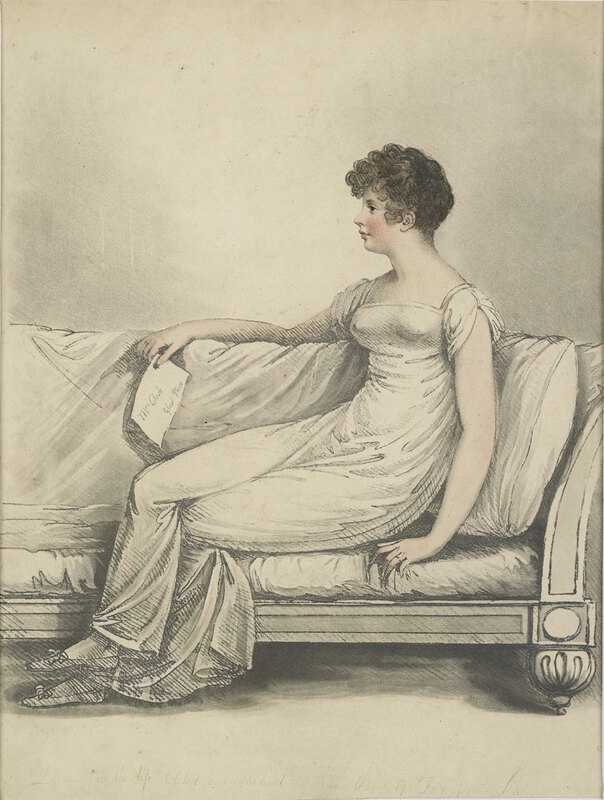 While readers of Jane Austen’s novels may relish the exhibition for the visual insight it offers into Regency tastes and fashions, perhaps rather more significantly, Buck’s work offers a glimpse of the changing tastes and social attitudes of the period. Compare, for instance, Buck’s whimsical neoclassical portraits with William Charles Ross’s rich palette, romantic landscapes and sense of propriety. The differences tell part of the story of the transition from the slightly more relaxed social and artistic attitudes of the Regency, to the more staid life that emerged when William IV came to the throne and the subsequent early Victorian tightness. It’s all there in Buck’s miniatures, which serve as tiny mirrors reflecting the past. ‘An Elegant Society: Adam Buck, Artist in the Age of Jane Austen’ is at the Ashmolean Museum, Oxford, from 16 July–4 October 2015.